The historic Beaumont Hotel was refurbished and reopened in 2003. | Photo by Ouray School. The brick, three-story Beaumont Hotel was built in 1886 at a cost of $75,000 as the “Flagship of the San Juans,” with original furniture made by Marshall Field’s of Chicago and a grand oak staircase leading to a rosewood-paneled dining room on the second floor. The Beaumont, which is listed on the National Register of Historic Places, is a blend of architectural styles, including Victorian, Queen Ann and French Second Empire. It has a slate mansard roof in the Second Empire style and was one of the country’s first hotels to be wired for alternating current electricity. 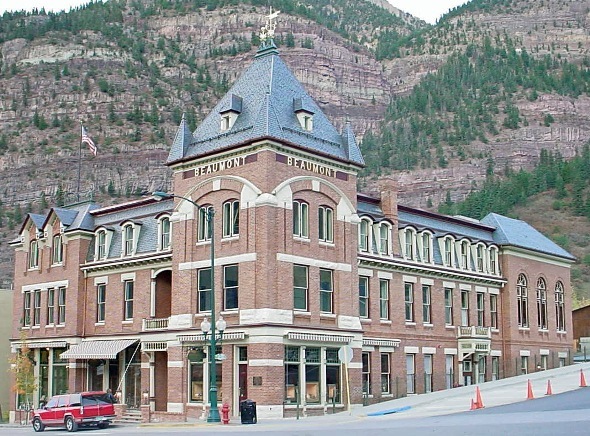 The hotel’s famous guests include Presidents Theodore Roosevelt and Herbert Hoover, King Leopold II of Belgium, French actress Sarah Bernhardt and Chipeta, the widow of the then-deceased Ute Chief Ouray. The hotel closed in 1964 because of declining tourism and sat empty for more than 30 years, boarded up and in disrepair. Part of the roof collapsed, and the building was considered for condemnation. The hotel was sold in 1998 and restored, reducing the number of guest rooms to just 12 when it reopened as a hotel and spa in 2003.